Despite its terrifying reputation (30 foot high standing waves, the roar of the sea being heard 10 miles away, etc, etc.) 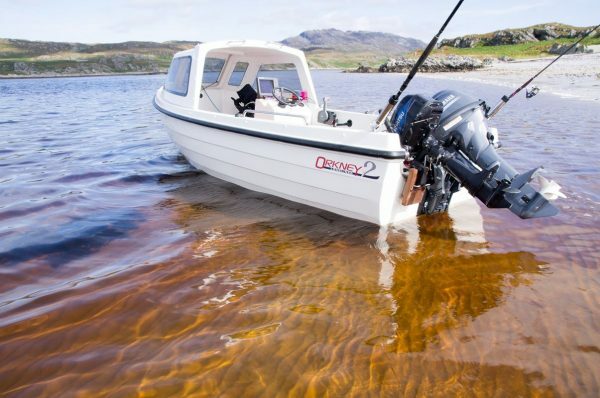 it was pretty obvious that lots of small craft, from yachts to kayaks, made it in one piece and it was more a question of the right tides, weather and timing. 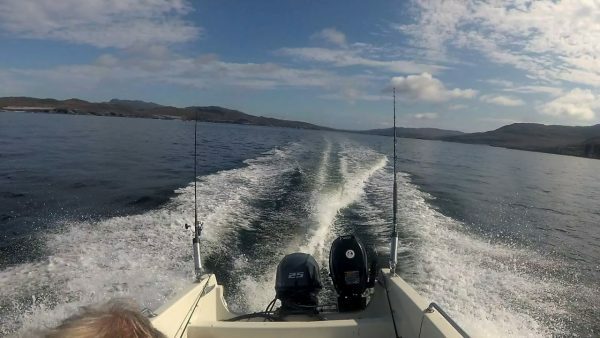 Aligning these three with enough time off work delayed things, but last week saw me trailing the boat across to a spot called Carsaig (near Crinan). The Longliner was loaded up with a little more than normal, to allow for a tent and sleeping bag, before nosing out into the Sound of Jura and taking advantage of the late summer sun as we headed over to Jura. 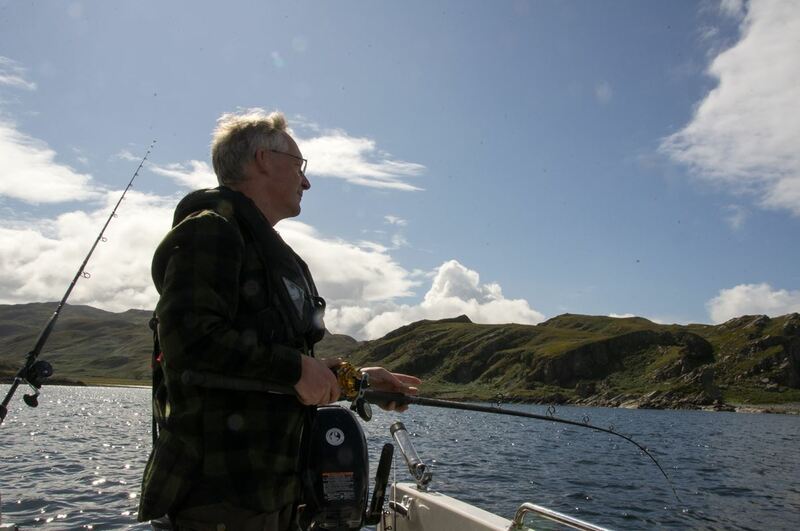 There was a little time to kill before the tide was right for Corryvreckan so I had a little fish around the farmhouse at Barnhill (its main claim to fame being the place where George Orwell wrote “1984”). One lonely coalie later I continued on my way, along an equally lonely coastline. Barring a hikers bothy the next human habitation was another 30 miles ahead of me. 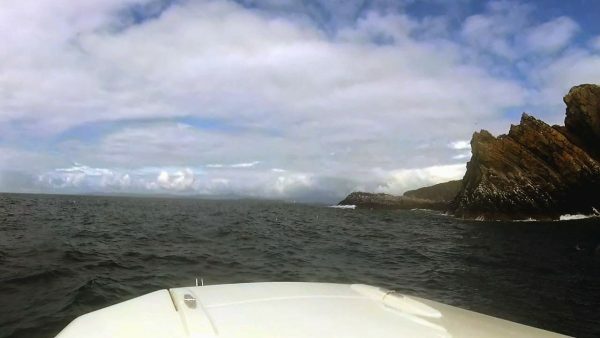 In the event a light NW wind, very small tides and slack water saw me heading through Corryvreckan in very anti-climactic fashion with a small swell of less than a metre and no overfalls to worry about. A few minutes later I popped out the far side and into a pretty rugged stretch of coastline. At that point it dawned on me that the Yam must have completed it’s 10 hour run in period somewhere in the middle of Corryvreckan. Pretty much academic really, but it gave me a little satisfaction at the thought. Run-in complete – in the middle of Corryvreckan! 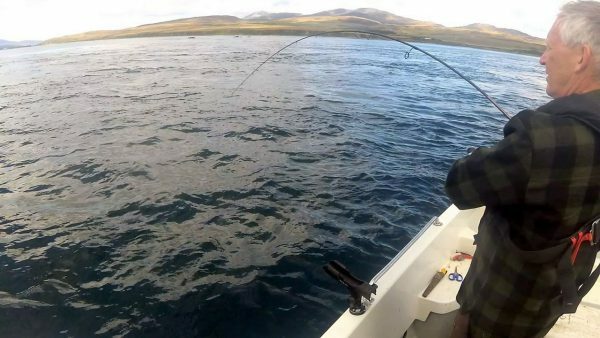 30 minutes fishing saw loads of mackerel and some coalies, plus pollack to 3lbs or so on feathers close in to the small islands at the edge of Corryvreckan, but I didn’t hang around here given that I’d quite a way to go and the tide run was quite noticeable even at slack water. As I mentioned nobody at all lives on the west coast of Jura, with a single bothy and a summer house owned by the Astor family being the only buildings, so pretty genuinely a trackless wilderness. 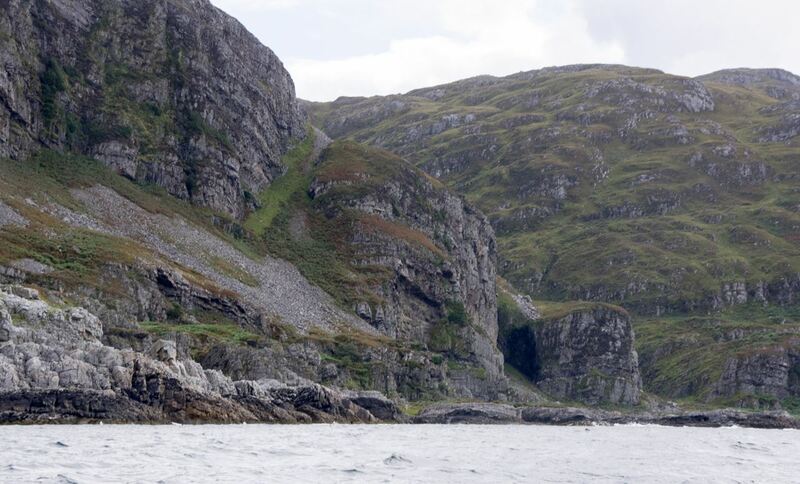 Formidable cliffs line the NW coast of Jura. Full of raised beaches and with a neat ring of rock lying just offshore that varies between just above or just below the surface – so very tricky to get ashore unless you’re in a kayak. I’d kind of hoped to do just that near the bothy at Glengarrisdale, but the swell was washing onto a boulder beach and it looked a distinctly bad idea at that stage of tide (around mid-tide it’s pretty much a sandy beach). Glengarrisdale is also the home of the Cave of Macleans Skull, or at least was so up until comparatively recently. The story goes that one of the many, many skirmishes between the clans occurred here sometime in the 1600s and no-one got around to burying all the casualties at the time. 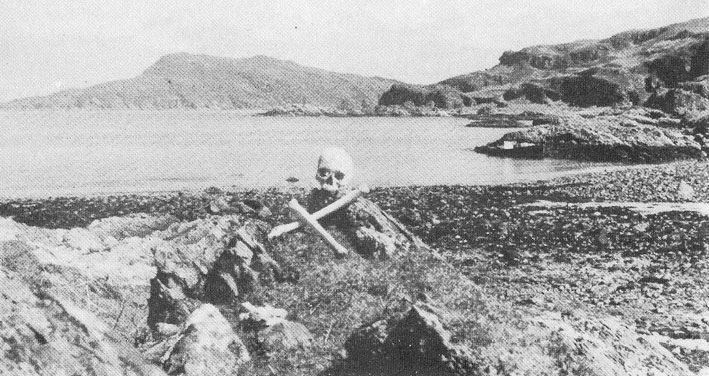 Consequently Maclean’s skull had a cave to himself for a few hundred years, barring the odd visiting hiker, until he finally disappeared about 40 years ago. The tale perhaps underlines how remote this area is, as I can’t quite see the same thing happening in Edinburgh. I trundled down the coast for a few more hours and stopped off to fish a sandy bank just offshore from Loch Tarbet. Perhaps 50 feet of water and very little tide and my baits were completely shredded by small critters quite quickly. 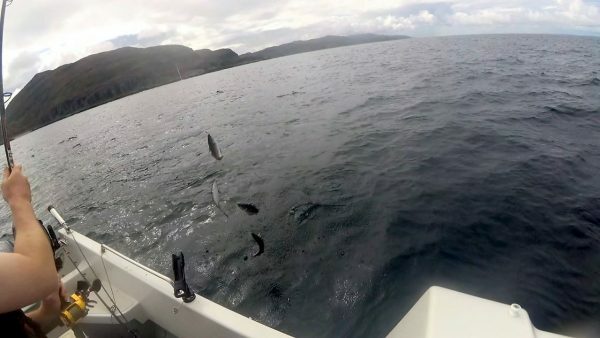 I tried a livebaited mackerel in case some tope had headed up from Islay, but nothing doing in the hour or two I gave it. 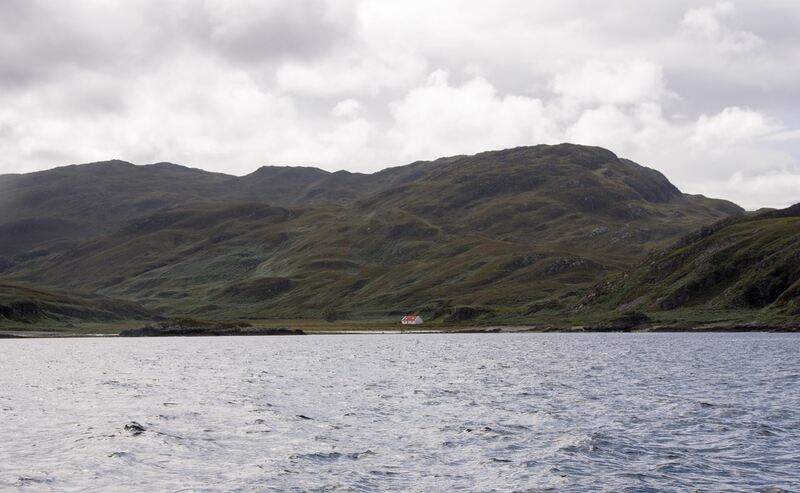 Perhaps not too surprising given the tide, relatively short time and generally random nature of the mark, but I headed into Loch Tarbet to find somewhere to sleep overnight. Tarbet is one of these lochs that just keeps on going and it very nearly cuts Jura in half, but with three or four channels maybe only 20 metres across and others with plenty of rocks in them it requires quite a lot of care even in a wee boat like mine. It was getting on a bit by now and I was tired so I decided to stop playing dodgems with the reefs and find somewhere to rest up and get some food. I dropped anchor in shallow water, just in the lee of a headland and sorted myself some dinner as the light faded (Wayfarer’s Chilli con Carne if you want to know, and not at all bad). With the cover on the Longliner she converts into rather a large tent and was quite comfy on a calm night so I got a decent night’s sleep. I could have headed ashore and popped up the tent but it was easier and more midge-friendly to stay afloat this time around. Morning saw me spend a couple of hours trying a hole in the loch in search of rays, but really just repeating the experience of the day before – lots of wee things having their breakfast at my expense. Somewhat frustrated I headed back down the loch aways and came inshore to scrunch around an impressively massive shingle bank that represents multiple layers of raised beaches. My boat is in the photo, so gives some sense of scale. Further round Jura and you get into the Sound of Islay, where the coast is a little more civilised but overshadowed by quite impressive mountains in the form of the Paps of Jura. 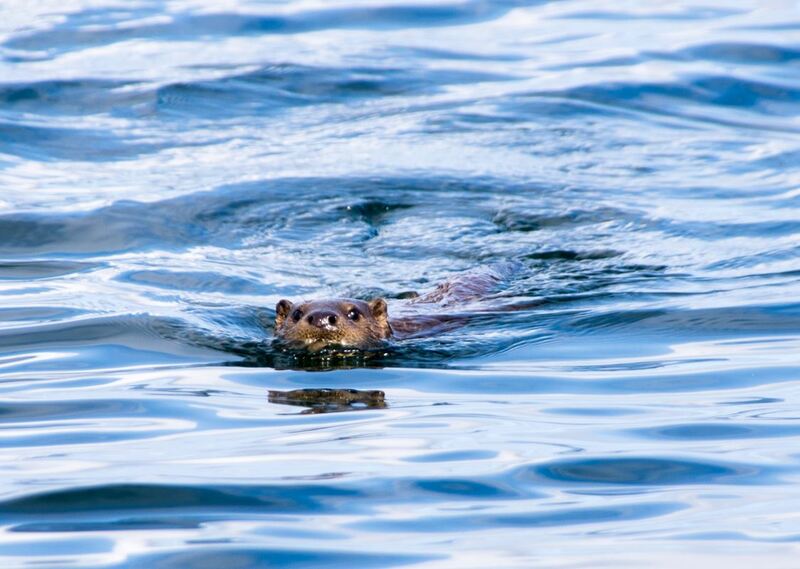 Round here I was extricating myself from between some rocks near the shore when I encountered a pair of otters. 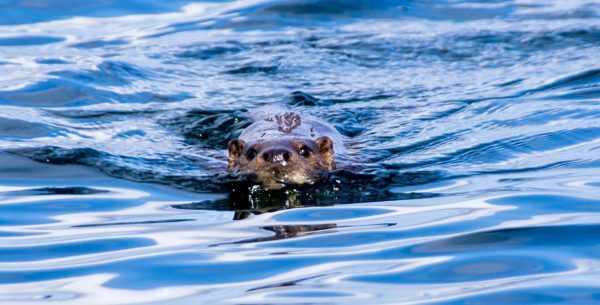 One was a bit shy but the other just swam towards me and seemed quite curious rather than nervous – I’ve never seen that before, as usually they disappear quickly if any anglers appear. I tried a couple of spots along the way but had only coalies and small pollack until I made a final stop at the Black Rock near the SE tip of Jura. 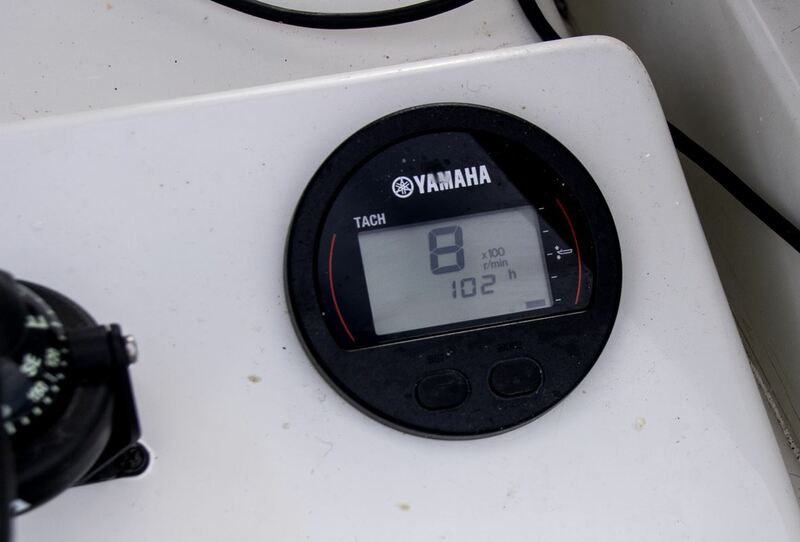 A big tide rip even in a tiny tide and a chart that was clearly not 100% right (my sonar showed 8 feet above the rock, where the chart clearly said a minimum of double that…). However it screamed pollack and duly obliged to mackerel trip and jelly worm on a 1 oz lead. Loads of smaller fish to 4lbs or so, and I hit three much larger ones – one shed the hook, one straightened it and I landed one at 7lb 12 oz. All these came close in to the very shallow top of the reef. No photo unfortunately as the GoPro threw a wobbly filming it, just after I popped it back 🙁 I only managed about 45 minutes here before I’d to head back up the east coast of Jura to get back before the tide dropped too far, but it must hold larger fish – although whether I’d want to be near here on a large tide is a bit doubtful. dimension too. 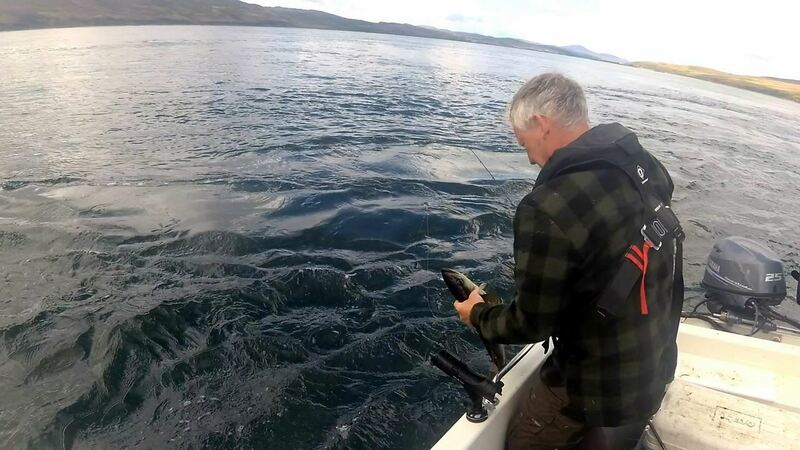 It was more of an explore/wander about than a fishing trip, but (unsurprisingly) there are some good fish around the tide rips at the north and south ends. Not so sure about the bits in the middle though!